There is a vessel without sides, ever full, yet ever empty. There is a river without end. Ever still, yet ever flowing. Fathomless, it is the origin of all things. The Sacred Islands: A medieval land of noble samurai and animal spirits. Of scheming nobles, of magic and ancient mystery. Kitsune Sura, a wandering fox priestess, assembles a group of would-be monster hunters. Penniless and carefree, they travel from palaces to villages, seeking out dangerous mysteries. 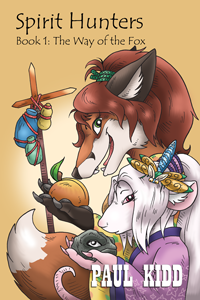 A fox, two samurai and a shy and gracious rat go forth on a career of bizarre adventures. The Spirit Hunters battle ghosts, tangle with magic and delve into terrifying puzzles. They must even survive the horrors of kitsune cuisine. These are the first three adventures of the Spirit Hunters saga. Bright, funny and exciting – these are tales of cunning monsters, flashing swords, stalwart samurai, faithful rats – and the rather dodgy antics of a fox. Delightful romps in a gorgeous magical Japanese otherwhen.